Note: Goodbits must be your sending provider in order to enable a landing site. Landing sites are helpful for growing your readership and for displaying an archive of your issues for search engines and future subscribers. Head over to our boosters (nav option in the sidebar) and click on the Landing Site and enable it. If you are not using Goodbits as your sending provider, you will be prompted to change this in order to enable a landing site. You can now configure the subdomain name if you want to host your content on Goodbits or if you are on a Pro account setup a custom domain for that content. To customize the appearance of the landing site, click on the 'Edit Theme' button. From the designer shown you can change the following of the landing site. Once you've added all the customization you want, click 'Save Settings' and scroll down to see your changes. Below a preview. 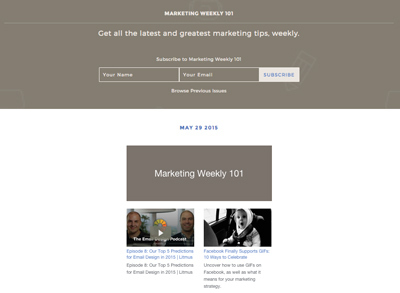 And what your subscribers will see when they receive your email newsletter in their inbox when they click 'view in browser'. Please note: your most recent email newsletter sent to your subscribers will appear when previewing your landing site, not the current issue you're working on. Currently when you enable a landing site we will create a subdomain on 'ongoodbits.com' for you. This is one that you can change to your liking but if you want to further brand your email newsletter, we allow you to set up a custom domain. To set up your custom domain you must modify DNS records to set up an ALIAS or CNAME (if a subdomain) to 'ongoodbits.com'. Under your landing site settings page, which is accessible from your boosters (found on the left sidebar). Under the landing site settings, flip the toggle for using a custom domain and enter the domain you would like to use. Don't worry, if in the preview under the settings, you don't see a page. This means that your DNS has yet to be set up. Below are the two common ways that the DNS can be configured with us. 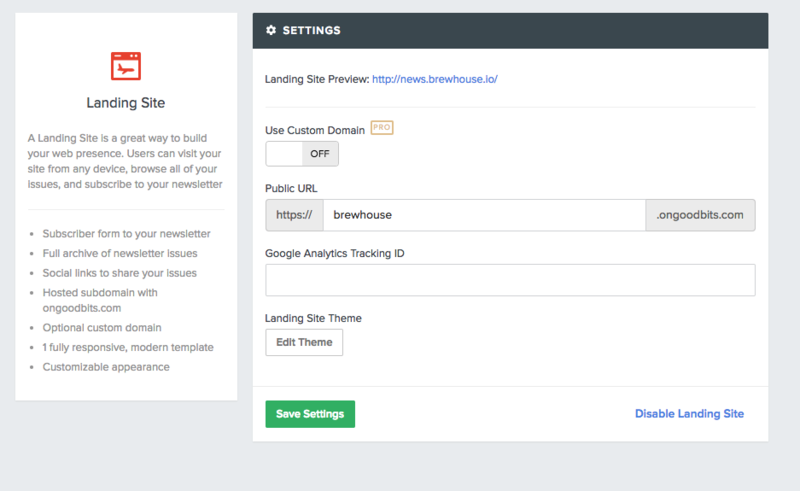 A subdomain type of domain name would be one such as 'www.newsletter.com' or 'newsletter.brewhouse.io'. You can set this up with your DNS using a CNAME record. This record below is what would need to be added to get a 'www' subdomain working. If you are setting up a 'www' subdomain redirect, don't forget to look into setting up a forward on your root level domain. A root level domain is for when you would like to set up a domain like 'newsletter.com'. This is not for when you would like to use 'www.newsletter.com'; refer to below to set up that as it is a subdomain. Some DNS providers allow you to set up this kind of domain. We would recommend that you set up a subdomain 'www.newsletter.com' and have your top level domain 'newsletter.com' redirect to 'www.newsletter.com'. Here is an overview of the generic record that needs to be defined. ALIAS or ANAME <empty> or @ ongoodbits.com. If you are confused or things aren't working correctly, feel free to reach out to us and we'll be happy to help you get this set up.